Beirut, Lebanon: June 21, 2018: Organized by Business France, the national agency in charge of the international development of the French economy, in collaboration with MEREF - CCI France Lebanon (Mouvement des Entreprises et Représentations Economiques Françaises au Liban), a French Pavillion will be created to introduce 18 companies at Project Lebanon, taking place from June 26th to the 29th, 2018. For the 10th consecutive year, France has a strong representation at this fair with its long-term commitment to the region, reinforcing the importance of this annual event in Lebanon. 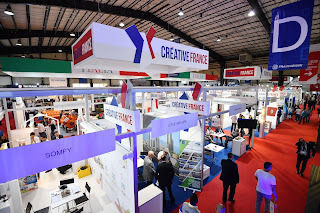 Under the theme of "Creative France", the 18 companies exhibiting will display French innovation and expertise through a variety of industries. “We are very delighted to once again debut France’s premium products and technologies at the French Pavilion during Project Lebanon. We have long supported the progress of the rebuilding and construction of Lebanon and we’ll continue to cross share innovations through this essential event. We have brought together 18 leading French companies to the pavilion and look forward to exchanging ideas and future business together,” said Marie Maamarie, head of Business France in Lebanon. The French Pavillion will host a number of companies showcasing their new products and latest technology in the construction and engineering. The categories of companies and products will include building engineering, public works, studies and monitoring, energy management and secure energy, building materials, stretch ceilings, LED lighting products, automation of building openings and closures, home automation products, cable laying and wiring, and banking and insurance services. Project Lebanon which has been running for 23 years, is an International Trade Exhibition for Construction Materials and Equipment for Lebanon and the Middle East, and is the premier event of its kind in the region, bringing together industry leaders from around the world. In its 2017 edition, 313 exhibitors from 23 countries showcased their latest products and services to 17,639 unique visitors. 2018 will see an increased number of exhibitors and unique visitors. As one of the key partners, the French representation at the fair is one of the most important as representatives of the 18 companies will be meeting with Lebanese counterparts and potential client to exchange ideas and build lasting and fruitful business relations. The event will allow face-to-face networking opportunities with a high-quality audience and will enable participants to establish new contacts, renew existing partnerships, and explore new business opportunities. بيروت، لبنان: 21 يونيو 2018: ستقوم بيزنس فرانس “Business France” الوكالة الوطنية المعنية بتنمية الاقتصاد الفرنسي دوليا- بالتعاون مع ميريف- غرفة التجارة الفرنسية – اللبنانية MEREF - CCI France” “Lebanon باقامة جناح فرنسي يضم 18 شركة فرنسية بالمعرض الدولي مشروع لبنان “Project Lebanon” الذي سيقام في الفترة من 26 إلي 29 يونيو 2018. وقد تحدثت السيدة ماري مماري، مديرة بيزنس فرانس في لبنان، قائلة: "يسعدنا أن نعرض من جديد منتجات وتقنيات فرنسية مميزة بالجناح الفرنسي بمعرض مشروع لبنان. لقد دعمنا تطور عملية البناء والعمران التي تشهدها لبنان منذ زمن طويل وسنستمر في تبادل الابتكارات خلال هذه الفعالية. قمنا بتجميع 18 شركة فرنسية رائدة في هذا الجناح ونتطلع إلى تبادل الأفكار والأعمال مستقبليا". سوف يستضيف الجناح الفرنسي 18 من الشركات الراغبة في عرض أحدث المنتجات والتكنولوجيات في مجال البناء و الهندسة. تشمل مجموعة المنتجات الهندسة الإنشائية والأشغال العامة والدراسات والمراقبة وإدارة الطاقة والطاقة الآمنة ومواد البناء والأسقف المشدودة وأنظمة إضاءة LED وأتمتة أنظمة فتاحات المباني واغلاقها ومنتجات الأتمتة المنزلية ومد الكابلات والأسلاك والخدمات المصرفية والتأمينية. هذا ويعد معرض مشروع لبنان في نسخته الثالثة والعشرين معرضاَ تجارياً دولياً لمواد ومعدات البناء بلبنان وبمنظقة الشرق الأوسط وهو الأول من نوعه بالمنطقة حيث يجمع رائدي الصناعة من مختلف أنحاء العالم. وقد حضر هذا المعرض في العام الماضي 313 مشارك من 23 دولة لعرض أحدث المنتجات والخدمات وقد وصل عدد الزوار الى17,639 زائر. وبما أن فرنسا تعد شريكاً أساسياً فإن التمثيل الفرنسي في هذا المعرض يأتي ضمن الأكبر هذا العام حيث سيقابل ممثلو 18 شركة نظرائهم وشركائهم اللبنانيين وذلك من أجل تبادل الأفكار وبناء علاقات تجارية طويلة ومثمرة. وستتيح هذه الفعالية فرصة التواصل المباشرة مع الجمهور ذو مستوى عال وسيمكن للمشتركين أيضاً التواصل مع شركاء جدد بالإضافة إلى تجديد الشراكات القائمة واستكشاف فرص أعمال جديدة.